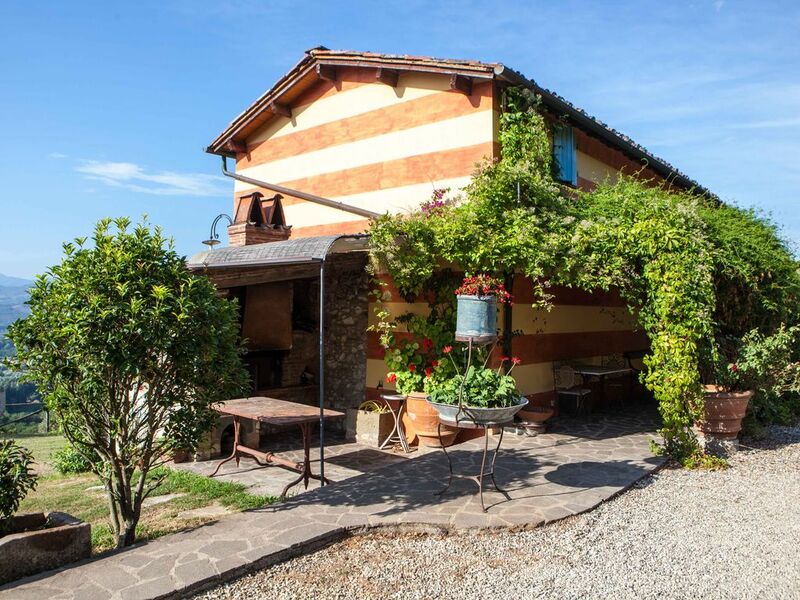 Enchanting cottage with outbuilding of 1700 completely renovated, surrounded by the hills of Lucca, a few km from the center and from the wonders of Tuscany. Well located to reach the main cities such as Pisa (20 km), Florence (60Km), Versilia (25km), Siena (120km). With a breathtaking view you will enjoy a holiday spoiled by every comfort: wi-fi, swimming pool, barbecue, garden to dinne outside and inside the house you will be greeted by a typical characteristic of the Italian refined countryside of Lucca. The garden allows you to live different sensations and unique experience such as: the bench under the olive tree to enjoy the view, the tables of antiques to have breakfast with nature, the pool with the streetlights' 700, great for swimming, with deck chairs and sun loungers, table tennis, among olive trees and much more will wrap your senses at Villa dell’Ortensia. On the ground floor, the living room with sofas and tables and chairs, unique pieces of art reflect the taste of the owner, an art dealer from nearby Pietrasanta which led to his feelings inside the house. A beautiful kitchen suitable for cooking Tuscan recipe and bathroom are on the same floor and then up to the upper floor you’ll find 3 bedrooms, 2 double and 1 twin bedroom with very special mural that gives character to the room. A large bathroom and another service bathroom are available to guests. The fourth bedroom is reached from the outside to ensure privacy and relax and where there is also another bathroom and laundry area. if you need it , this is an extra cost. the owner leave in depandance inside property. your privacy is garantee. Pool in exclusive. Das Grundstück/Haus/Pool sind wunderbar. Der Besitzer Bruno (der mit auf dem Grundstück wohnt, was okay ist, aber erwähnt werden sollte) ist freundlich und direkt - hält alles sauber und ordentlich. Katzenliebhaber haben Glück. Der Weg zum Haus erfordert einen wendigen SUV oder sehr gute Fahrkenntnisse und Mut. Unser VW-Bus hatte Probleme, weil sehr steil, enge Kurven, steiniger Waldweg... insgesamt ein toller Aufenthalt in einem tollen Ambiente!! !